For the moment, Brett Favre has retired and will not be playing with the Minnesota Vikings in 2010-11. Does that mean he is actually retired? Who knows? But for now, Favre’s absence from the Vikings’ roster is having a startling affect on the team’s ticket prices on the secondary market. SeatGeek’s Team Pages track the average ticket price for each team in the NFL over the last week, and rank the teams based on price. Over the past week, since news of Favre’s retirement, Vikings’ tickets have averaged only $45, which ranks them dead last out of the 32 NFL teams! 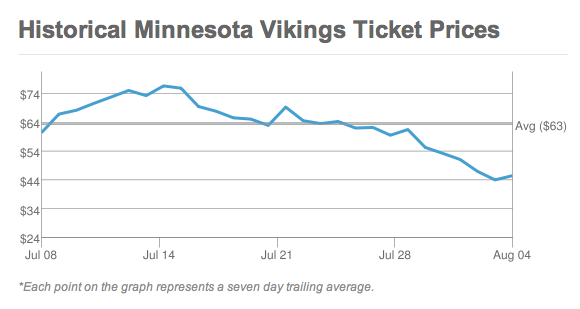 Their current ticket price averages are also well below the Vikings’ historical average of $63. Click here to see the Minnesota Vikings Ticket Price & Fan Sentiment page. What’s more, historical ticket prices for the Vikings have trended severely downward in the last week or so. Even before Favre retired, the uncertainty surrounding his status may have driven the price for tickets down on the secondary market. Certainly, fans’ willingness to pay a premium for tickets is a reflection of the product on the field; if an NFL legend such as Brett Favre is no longer playing for the Vikings, fans are not willing to pay as much as for tickets. The highest prices are not surprisingly for the Packers vs. Vikings game at the Metrodome on November 21. Tickets for this game on average are listing for $186. However, listing prices for tickets for Vikings’ away games are much higher than Vikings’ home games. In fact, the highest priced away game is Vikings vs. Packers at Lambeau Field on October 24. Tickets for this game are listing for an average of $395. As it stands now, though, Packers fans will not see their ex-QB Brett Favre play. Curious to see where your favorite team ranks? Click here to see the ticket price rankings for all 32 NFL teams! There are still many who don’t believe Favre will actually retire, as this Hyundai commercial below alludes to (2020 MVP at the age of 51?!). If you are one of those people, it might not be a bad idea to snag some tickets for cheaper than usual during Favre’s brief hiatus, as prices will undoubtedly spike if/when he returns to the field. For any inquiries, feel free to email me at justin[at]seatgeek.com Also, remember to follow us on Twitter @SeatGeek and ‘Like’ us on Facebook for more ticket, sports and concert news!